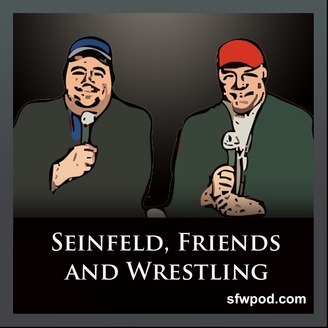 On each episode Rich and Jim will pick a week between July 1989 and May 2004 and review the episode of Seinfeld that debuted during that week and / or the episode of Friends that debuted that week and they will take a look at what was happening in the world of professional wrestling that same week. This is Episode 20 of Seinfeld, Friends and Wrestling: A Real and Spectacular Podcast. Rich Wayne and Jim Fannin discuss the week of 7/2/1989. Here’s a breakdown of the episode: 0:00 – 0:03 Open 0:03 – 0:28 Seinfeld 1.1 “The Seinfeld Chronicles” from 7/5/1989. This is the pilot episode of Seinfeld. 0:28 – 0:43 Seinfeld “Best of the Rest” 0:43 – 0:46 Seinfeld Finale 0:46 – 0:50 Friends Finale 0:50 – 1:40 WWF The Mega Powers Explode at WrestleMania 5 from 4/2/1989 as Randy Savage defends his WWF World Title against Hulk Hogan. 1:40 – 1:43 WWF The Brainbusters vs Hart Foundation at Summerslam 1989 from 8/28/1989. 1:43 – 2:16 WCW Ric Flair vs Ricky Steamboat Trilogy from 1989. 2:16 – 2:32 WCW Ric Flair vs Terry Funk feud from 1989. 2:32 – 2:51 WCW Rick Steiner and Robin Green angle from 1989. 2:51 – 2:53 Wrapup.